Personal Perspective: Why Is the Japanese American Memorial to Patriotism in World War II a National Monument? 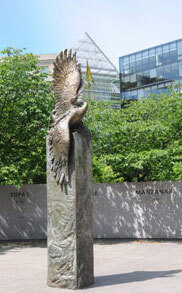 The Japanese American Memorial to Patriotism in World War II features a bronze sculpture, named “Golden Cranes,” and stands amongst a semicircular granite wall that features the inscriptions of the names of the 10 major internment camps. There are also three panels that feature the names of Japanese Americans who died fighting in World War II, inscribed writings by Japanese American writers and quotes by President Harry S. Truman and President Ronald Reagan. It was dedicated on Nov. 9, 2000. Visitors to our nation’s capitol are encouraged to visit the National Japanese American Memorial to Patriotism in World War II. This memorial conveys the story of how the federal government, motivated by prejudice, war hysteria and political ambition, unjustly disrupted the lives of 120,000 innocent persons of Japanese ancestry. The memorial instructs us how Japanese Americans proved their loyalty so that their freedoms and rights could be restored. By telling this story, it preserves three important lessons. First, it honors the patriotism of those who persevered under the bigotry of tyranny imposed by Executive Order 9066, signed by President Franklin D. Roosevelt on Feb. 19, 1942. The memorial also pays tribute to the Japanese Americans who answered the call to serve their country while their family and friends were unjustly imprisoned in America’s concentration camps. Second, the memorial epitomizes the best of America’s democratic values. With the enactment of the Civil Liberties Act of 1988 (aka Redress), America admitted its mistakes in violating constitutional rights of its citizens, made amends and affirmed its commitment to equal justice under the law. By admitting its wrongs, America brings us together so that we can work to protect the constitutional rights for all. The memorial also teaches that we must not be blinded by fear, hatred, prejudice or partisan politics in pursuing equal justice under the law for all. The third lesson is that the memorial condemns racial profiling. Executive Order 9066 is a classic example of racial profiling. It authorized the government to restrict constitutional rights based solely on ethnicity. We must never forget that racial profiling is discriminatory. The memorial reminds us that actions motivated by the government to promote fear, hatred and prejudice based solely on ethnicity must not be tolerated. These lessons are the important legacy that must not be forgotten by the American public and future generations. Preserving this legacy is why the Japanese American Memorial to Patriotism in World War II was authorized by law as a national monument and was built within view of the U.S. Capitol. Gerald Yamada was pro bono general counsel to the National Japanese American Memorial Foundation from 1996-2005. The foundation built the memorial, which opened to the public in 2001. He also was the part-time executive director for the foundation from 2005-10.